In February 1964 steps were taken to organize the Potomac Valley Junior Hunt Club. 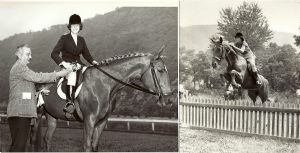 Mr. and Mrs. Frederick Steiding and Mrs. Robert F. Nierman of the Potomac Valley Riding Club were selected as the advisers. The purpose of the Junior Club was to instill in young people the art and finesse of English riding and help revive an interest in fox hunting through the club’s activities. One of the youth organizers and leaders of the Junior Club was Betsy Weisman of Cumberland. At the club’s March 1964 meeting, presided over by Weisman, members selected as its emblem a small red fox leaping over a log encircled with the club’s name. On May 24, 1964 the Potomac Valley Riding Club held its Fourth Annual Spring Horse Show at the Cumberland (now Allegany County) Fairgrounds. Over 1600 persons attended the event that was comprised of 26 classes and 165 entries. The Class 2 Horsemanship Award, for ages 13 through 17, went to Betsy Weisman atop her horse, "GiGi". Another Cumberland girl, Susan Steiding on "Red Guy", won the Class 4 Green Working Hunter competition. Along with the photo above depicting Weisman receiving her award, is a depiction of her jumping a fence aboard “Red Guy”, a horse owned by Mrs. Fred (Georgie) Steiding. Weisman was practicing for the Green Working Hunter Class competition, as well as the Horsemanship and English Pleasure Classes. Sources: Cumberland News, February 18, 1964; Cumberland News, March 3, 1964; Cumberland Evening Times, May 25, 1964.